The ideal way to collect, carry and process biological samples. The unit features a base which already incorporates a removable sterile 50 ml graduated polypropylene conical tube that can withstand centrifugation up to 5000 RPM, or 3000g. 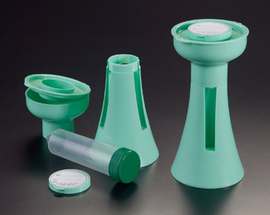 Available in a light green color, three narrow vertical windows allow the contents of the tube to be discreetly seen. A wide base ensures great stability and prevents tipping of the unit. The large collection funnel is made in such a way that specimens fall directly into the graduated centrifuge tube and do not contaminate the outside threads. The centrifuge tube screw cap is being kept sterile at all times under the snap cap on top of the funnel. A patient label is already affixed on top of the unit and can easily be transferred to the tube before leaving for the laboratory. The base can be used as a support during transit. Each unit is sterile and individually wrapped.